It seems hard to believe these days with hundreds of channels competing for every shot but for Capricorn Research’s generation, sport was packaged and delivered to our consciousness by one man, David Coleman. He was Saturday afternoons as the presenter of Grandstand, beginning at lunchtime with the inevitable horse racing or wrestling and still there at tea time with the most important event of our week, the football results. When we were old enough to stay up late he was still there with Match of the Day and the midweek Sportsnight with Coleman. David Coleman worked at the BBC for 50 years, covering some of the greatest sporting events of the 20th century, including the 1968 Mexico Olympics, the ill-fated Munich Olympics – where he broadcast for 30 hours during the siege by Palestinian terrorists – and numerous FA Cup and World Cup finals. He presented or commentated on 11 Olympic Games from Rome 1960 to Sydney 2000, as well as eight Commonwealth Games. He covered six World Cups as a commentator, including the finals of 1974 and 1978 and a seventh (1982) as a presenter. Unfortunately, no birth time is available so the chart is constructed for noon. Much of his incredible staying power would have come from the Sun’s position in Taurus but that only begins to tell the tale. 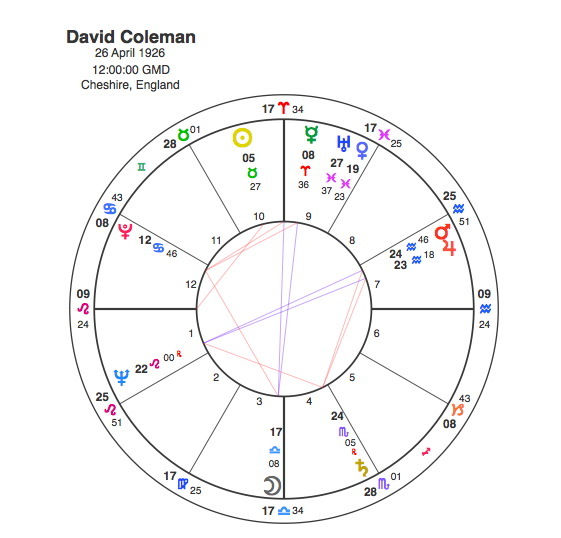 In fact Coleman’s Sun was unaspected and most of the action in his life comes from other parts of his chart. He had two T Squares, a sign of someone with extremely strong energy, always on the go and propelled into activity by the challenges of the aspects. Any sporting commentator would need a strong Mercury and Coleman’s in the major T square was in the competitive and assertive Aries. Mercury was opposite the Moon in Libra providing an evenness and a balance to his work. As a sports interviewer and presenter this opposition would be the perfect combination. David Coleman was a keen amateur runner, he won the Manchester Mile as a member of Stockport Harriers, the only non-international runner to do so. His second T Square was the one that changed his life and brought him onto our screens. Pluto entered the T Square in 1952 conjunct Neptune and square to the apex Saturn, a difficult combination that would point to the end ( Saturn ) of his dreams ( Neptune ). Coleman was unable to attend the 1952 Olympic trials because of hamstring injuries and his career as a competitive runner was over. His response was to approach the BBC to see if they would like any help with athletics coverage. In 1954 Coleman joined the BBC as a news assistant and sports editor. His first television appearance was on Sportsview, most auspiciously on May 6th 1954, the day that Roger Bannister broke the four-minute mile. Of course most people would dismiss this as a coincidence, but in astrology there is no such thing. Symbolic resonance is the core of our subject and it is most fitting that the man who dominated television sport, particularly athletics for decades made his entrance at such a point in history. At the other end of the T Square is a powerful conjunction of Mars and Jupiter in Aquarius and Pluto was in opposition to both in 1954. The beginning of a immense ( Jupiter ) career in sports ( Mars ) TV broadcasting ( Aquarius ) was inevitably triggered by Pluto the planet of reinvention. Out of the ashes of a transit to Saturn / Neptune with injury causing the end of his running career came the Mars / Jupiter phoenix like ascent to TV sports immortality. Coleman was the BBC’s senior football commentator covering the World Cup Finals in 1974 and 1978, the European Cup Finals in 1973 and 1975 and the FA Cup final from 1972 to 1976. His last live football commentary was the England v Scotland game in the 1979 Home International Championship. In the same year he became the host of the sports quiz show, A Question Of Sport, a role he held for a generation. This was another watershed period in Coleman’s career as Pluto transitted the Moon / Mercury T Square, opposite Mercury from 1974 – 6, square its own position from 76 – 77 and conjunct the Moon from 78 – 79. At the age of 53, David Coleman’s career shifted from the ubiquitous sports anchorman with a significant change of gear to the chummy combination of facts and banter with sports champions of the day that characterised the quiz show. With Pluto opposite his Sun in 1984, Coleman reduced his phenomenal output and concentrated on his first love, athletics commentary. In 1992 with Pluto making another T Square appearance, David Coleman received the OBE in recognition of his services to TV sports broadcasting ( Pluto was square Mars / Jupiter in Aquarius ). He retired after the 2000 Olympics and was presented with the Olympic Order in recognition of his services to the games’ ideals. David Coleman died in December 2013 after a short illness with Pluto creating a Grand Cross square to Mercury and the Moon and opposite its own natal position. Capricorn Research has a lifelong obsession with sport, particularly football and would like to thank David Coleman for fuelling and inspiring so much of it.